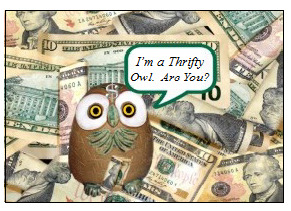 Owl Creek Gazette: What Does Being "Thrifty" Mean to You? What Does Being "Thrifty" Mean to You? We'd love to hear what being "thrifty" means to you ... please share your thoughts and examples of "thriftiness" here with us. I'd have to say being "thrifty" is like enjoying something for what it is at its real value. There's something very special about getting something for free or very cheap. You feel an accomplishment for being able to get it for less. Also, it's always good to be able to give the same as you get. Virtuous circles help EVERYBODY! Thrifty, to me, means seeing the value in things - not much qualifies as "garbage" to me! What can't be eaten, reused, recycled, or repurposed can often be composted, for instance. I also make a lot of things for myself that other people buy - like a soda and salt tooth powder, and a face wash of aloe, green tea, calendula (which I grow myself) and honey. And I rarely buy clothes - my friends and I pass bags of clothes along to one another, take what we like, and pass along the rest! Lori ... love your comment and the mindset/practice of not much qualifying as "garbage". Also love the practice you and your friends have of passing bags of clothes on to each other -- how thrifty and fun! Being thrifty is something my parents and grandparents instilled in me at a young age. I can hear them now saying, "If you don't have enough money in your pocket to buy it, you don't need it." I don't use credit cards or buy on credit even today. I'm debt free. I don't have a lot of garden space but I have a friend who has 7 acres. We have a sort of family/friend community garden that has grown in size these past two years. I am teaching these two bachelors how to can and freeze what we grow. I'm sure that next year we will have more ground tilled up and be planting around 4 acres. Note: This post is a repost of a comment I had posted, then deleted, as the original post had some strange spacing problems which made it difficult to read.